My Great Great Grandfather was James Bettis who was born in 1825. (I have seen some family trees that have his birth date as 4/11/1825 and another that has him down as James Edmund Bettis, though I have seen no documents or records to concur (or disagree) with either) He was born in Stanford Rivers, lived all his adult life in Ivy Chimneys Lane, worked as an Agricultural Labourer, and died in 1872 in hospital at the Epping Union Workhouse. So… the obvious things of note are the Lodger / Mistress / Wife status of Emma and the change of surname of the children. 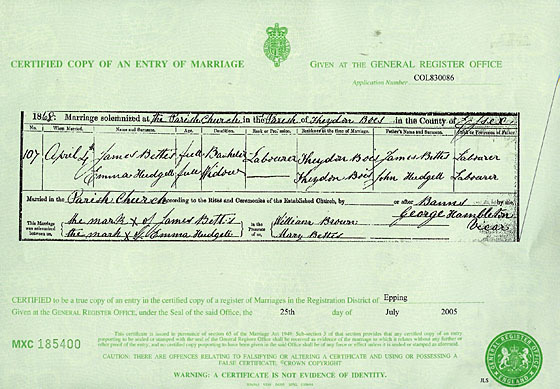 Emma Hudgell was born Emma Radley, married Thomas Hudgill in September 1841. In 1844 Thomas Hudgill was found guilty of obtaining money by deception and was sentenced to be transported to Australia for 7 years. He died on the journey to Australia, but Emma probably wouldn’t have known that. Emma then took up with James Bettis, and there is no reason to think that all her children were other than James’ – calling your first born after the father was common, so James, born in 1847, would fit with this – Though James did keep the Hudgell name all his life. The children (other than James) then took the Bettis name. On the 1871 census the youngest child Rosetta is listed as James and Emma’s Daughter, but it is pretty certain that she was born the illegitimate daughter of the then 18 year old MaryAnn. It’s a little strange that the birthplace of the older children is listed as Theydon Garnon, when they lived in Theydon Bois. 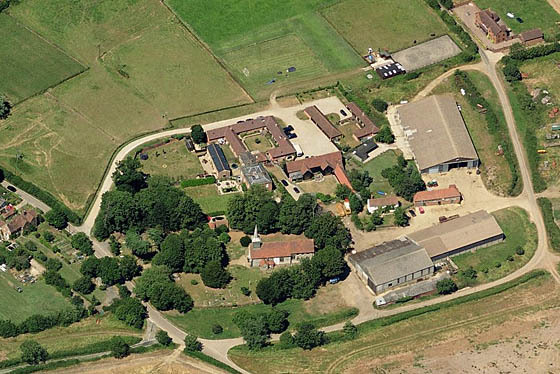 One possible explanation is that the local hospital, the “Workhouse of the Epping Poor Law Union” (opened 1838, later St Margaret’s Hospital Epping) was on the outskirts of Epping, in the Parish of Theydon Garnon, about a mile and a half away from Ivy Chimneys Road. There are people that say this record from the 1841 census also relates to this James Bettis, however I think it is unlikely as the census comes from East Tilbury which is 22 miles away from Stanford Rivers, there is the age which is wrong, 14 when he’d be 16 in 1841, the spelling of the name I can excuse as whoever this James was he wouldn’t be able to read or write so Bettis / Bettus is pretty close, and finally there is just no obvious reason why James would be in East Tilbury and then go back to Theydon Bois which is only 5 miles from Stanford Rivers. Well I guess we must be cousins of sorts..
My Great Great Great Great Grandfater was William Bettis – brother of James son of John Bettis and Mary Ray – born in 1823 in Stanford Rivers or High Ongar. He apparently married an Anne?? who was the mother of my GGG Grandmother Mary Anne Bettis – and then got caught stealing a sheap and was deported to Tasmania. From there he moved to New Zealand and died in 1904. 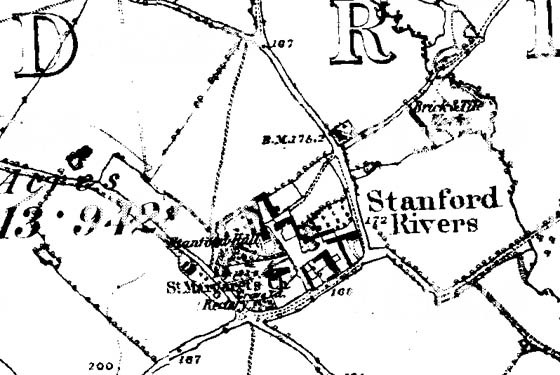 Am very interested in High Ongar and where it is relatively to Stanford Rivers and have some more information going back to John Bettis born circa 1700 who married Ann Brainwood (John Bettis is James and Williams Great Great Grandfather). hi there ,ive been tracing my family tree and most of them go way back to high ongar essex.my great great granfather was james bettis married a martha bettis ,i think somewhere along the line james and anne are also my ancestors i know ive come across one of my relatives marrying a brainwood and also further on one of them married someone with the surname knight they was quite a affluent family in high ongar kind regards caroline. Thank you for a wonderful site. I thought you may be interested to know a little about James and Emma’s son William. Gwendoline Bettis (b. married Frank William Bettis (1st cousins) They had no natural children but adopted 3 children. They had 3 children, one of whom is my Husband, David. Hope this may be of interest to you. Re: James Bettis b1825 son of John Bettis & Mary Ray. 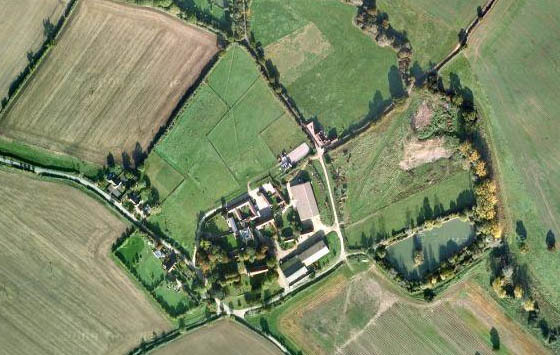 Weald Gullett, North Weald Bassett. James is shown as aged 15. Hope this helps someone on here.